Make over your home with decorating tricks that don’t cost a dime! Who says you have to spend money to makeover your home? 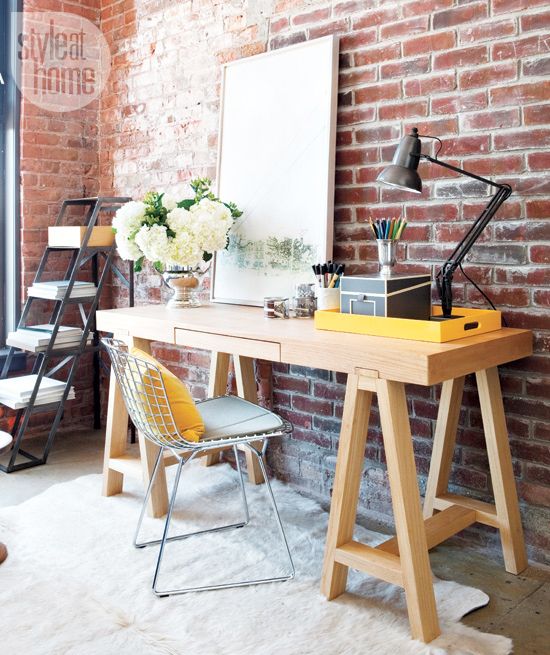 Here are some easy, fun and practical ideas for spiffing up your space without spending a cent. 1 Use old paint you have taking up space in the garage or shed, in new ways. Perk up a table, interior door, stair risers or a wooden chair that have seen better days by painting them in a bright, unexpected shade, or use painter’s tape to section off stripes to create borders on walls. Try painting a concrete floor for fun, perhaps in the basement laundry room. For wearability when painting floors, make sure to apply clear varnish on top of the paint once dry. 2 Dig out those fabric swatches you can’t bear to part with. They might be just the right size to re-cover your old throw cushions for your sofa or bed. Fabrics don’t have to be upholstery-type either; floral prints, stripes or gingham are fun for the summer, especially if the colour scheme is similar so you can mix and match. 3 Do you have boxes of photos that never get seen? Pull out some faves and replace your old framed pics with these ‘new’ ones. Group them in odd numbers on walls, shelves, coffee tables or mantles. 4 Re-arrange the furniture. Sometimes just moving your sofa into a new corner, or placing it on an angle, can make a world of difference in how a living room looks and feels. Rethink what rooms your furniture pieces call home now. Why not move that club chair into your bedroom, near a window for a nice reading nook? 5 Use up ribbon pieces to pretty up drawer handles or knobs, or to create napkin rings. 6 Put old wallpaper to good use by using pieces to create pretty drawer liners. 7 If you keep old greeting cards that are too pretty to throw into the recycling bin, bring them out of hiding and display them in clusters on a mantelpiece or on a corkboard. 8 Create a new headboard from a beautiful blanket or quilt. Just fold it neatly over the bed frame or existing headboard for a nice shot of fresh. 9 Have an outdoor garden with flowers in bloom? Cut some and bring inside to enjoy in every room of the house. 10 Don’t use your wood-burning fireplace much? Move your potted plants (those that don’t need much sunlight) or a large grouping of block candles in various heights into that empty space. 11 Mix two colours of bathroom towels on the racks and in baskets, rather than always reaching for a stack of the same shade. Try mixing your mint with aqua or turquoise with chocolate brown. 12 Repurpose small, empty bottles to become single bloom vases. We like clear glass in varied sizes and heights. Group in clusters. 13 Pull out those baskets you keep forgetting about and put them to good use to house magazines and books you’re presently reading at your bedside. Line with a pretty tea towel.